For me, now the flowers have started to bud, the weather is warming up and the days are getting longer, a definite start to spring and the need to tackle your spring cleaning. It shouldn’t be something you fear, it is a time to get your home ready for the summer. There is nothing better for me than seeing a room sparkle, and now the children are older and only one living at home, there is a chance for it to stay that way for a short time. It has, for me, to start in the kitchen; if the kitchen is clean then the rest of the house doesn’t feel so bad. It is more about putting away the winter things and just giving the surfaces a shine. If you regularly deep clean each room, there isn’t much that you won’t have tackled recently and this is good, it can mean that spring cleaning isn’t taxing. It is at this point that you can look at the areas of your home to decide upon the project that you hope to tackle this year. It will depend if you are renting your home or if you own it, to the amount of decoration you are able to do, but there are some great options for those people who rent, from decals that don’t damage the walls or by using picture hooks that are easily removable, to change the look and feel of a room. I know my Nan would change her curtains, she had winter curtains and summer curtains and these could change the whole feel of the room. This year I am focusing on my hallway for decoration, it is a big space and it will take time to get all the areas painted and finished, but it’s planned into the calendar and the jobs will complete to a flexible schedule, sometimes life can get in the way of even the best laid plans! To me spring cleaning brings the renewed spirit back into the home, it is a way to open up your home to the fresh scents of spring, to remove the germs and the feeling of winter from my home and start the process of enjoying the warmer weather. Ideally, I would like to include fresh flowers in this picture but unfortunately, I have two hay-fever sufferers, it is not fair to torture them with fresh flowers, so I have to use artificial flowers, but the arrangements of these flowers have improved over the years making a very pretty display. The idea of spring conjures up thoughts of washing drying on the line outside and the freshness this can bring when you wear an item or especially when you get into a freshly made bed, with line-dried sheets. If you are looking for inspiration of what to clean in a deep clean, it is the items that you don’t tend to clean regularly. For some it is the light fixtures, behind the appliances and underneath furniture, be warned though, you can often pull out more furniture and start cleaning and you can quickly become overwhelmed with the task in front of you. This is why it is easier to keep on top of the deep cleaning so it doesn’t require a mammoth cleaning task to take back control of your home. Therefore, if the thought of spring cleaning brings fear to mind, it doesn’t have to, with a bit of planning and deep cleaning regularly, your spring cleaning will be a breeze. Years ago, when I was a child, my mother also changed her curtains at the start of spring. I think this relates to when people didn’t have central heating, and coal/coke fires were a necessity. By the end of winter the curtains would have gathered coal dust and smokey fumes. By changing the curtains they were able to clean the heavy winter ones and make the room feel fresher by hanging a lighter pair of curtains. I had an early start to my spring cleaning when I had plantation blinds fitted. Because I had to take down my curtains and move furniture around, to give the installer room to move, I couldn’t wait for each room to be finished so I could get stuck in to some real cleaning before rehanging my curtains. Our summer has ended and we Autumn means cooler weather. I’ve lost all the momentum of spring but I want to soak up all the spring cleaning inspiration from all you northerners to get me motivated for a pre winter deep clean. 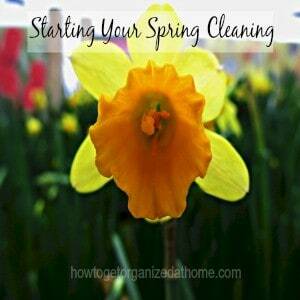 I am so glad that you can find inspiration from our spring cleaning maybe I will be motivated for a winter clean when you start your spring cleaning!